It is almost time for Tyler to come home! Tomorrow night starts his last week of class. The following week he has his FOB (not sure exactly what that stands for). Essentially, it is where they're in the field for a week putting what they've learned into a simulated practice. 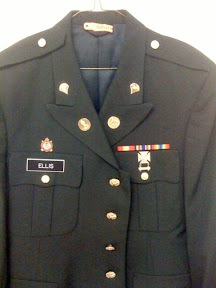 He went to the PX today and got his "brass" for his uniform. This puts him one step closer to his graduation. The only thing I know for sure is new is the ribbon bar.